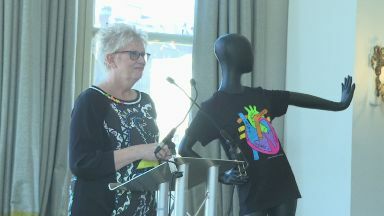 An internationally-acclaimed fashion designer has thrown his support behind a campaign to take on heart disease in Scotland. 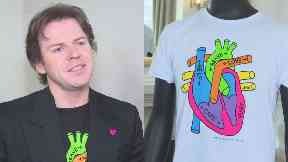 Christopher Kane, who grew up in North Lanarkshire and attended Taylor High School in Motherwell, has created a range of striking coloured badges and one-of-a-kind t-shirts for Heart Research UK's appeal. The Heart of Scotland campaign - which has garnered support from the likes of First Minister Nicola Sturgeon, singer-songwriter Amy Macdonald, writer Val McDermid, actor Mark Bonnar and former Manchester United boss David Moyes - launched on Wednesday at The Balmoral in Edinburgh. Speaking to STV News, designer Kane explained that he got involved for personal reasons. He said: "I'm here today to support the charity Heart Research UK. "And for me, heart disease is very relevant in my family. "My brother and my father died of heart attacks, and obviously to work for a charity like Heart Research was a no-brainer and anything I can do to speak out about what's happening and how it's a nationwide epidemic - especially in Scotland people are dying younger than ever - and it's a huge deal that we need to talk about. "The charity in itself - working with them has been such a privilege. "They're so happy and they're so proud of the initiative, and I couldn't be happier. "Personally being Scottish and personally been affected by heart disease in my family, it's the best cause really, I'm so happy." The Heart of Scotland appeal will include a dedicated week of fundraising and celebrations in the build up to June 21 - the longest day of the year. Barbara Harpham, Heart Research UK chief executive, said: "Most people in Scotland will have been touched by heart disease, the nation's single biggest killer. "The Heart of Scotland appeal is an opportunity for Scots to take on heart disease together. "We want this campaign to reach every corner of the country, Highlands and islands, lowlands, coast and country, and raise money to fund pioneering medical research in Scotland's hospitals and universities. "The fact is, you are almost twice as likely to die from coronary heart disease in Scotland than you are in the south-east of England. This needs to change and we need Scotland's help." 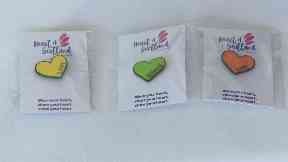 For more information and to get involved, go to heartofscotland.org.uk or call 0113 234 7474.